Speedmonkey: 2014 Ford Mondeo Spy Shot - A Car With Secrets? 2014 Ford Mondeo Spy Shot - A Car With Secrets? 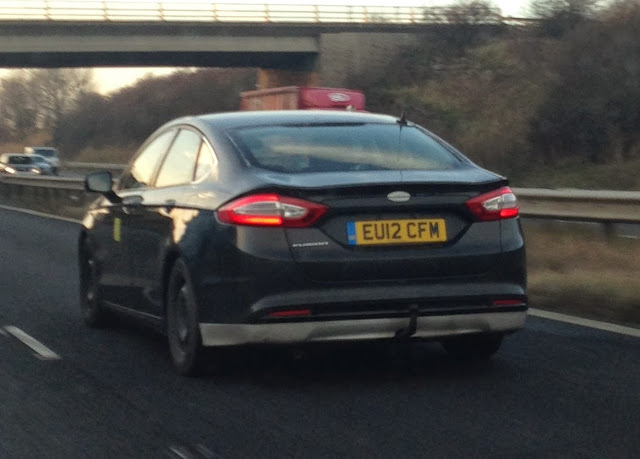 Richard Eaton caught this 2014 Ford Mondeo on the M62 recently. It was travelling in convoy with another 2014 Mondeo and a current model Mondeo. We've already seen the 2014 Mondeo, but this one has some secrets up its sleeve. Ford announced the fifth generation Mondeo in 2012, and displayed it at the North American International Auto Show that year. Launch was meant to be Autumn 2013 but was delayed until Autumn 2014. This explains why the Mondeo Richard saw was first registered on 11 June 2012. The delay was cited as being down to "…quality issues". I.e. Ford just couldn't get the 2014 Mondeo right. It may also have something to do with the fact that Europe has only just come out of recession, and the current Mondeo is still a good car. But look closely at the photo. The badge says Fusion, not Mondeo. And it's a right hand drive car. Maybe, just maybe Ford are planning to drop the venerable Mondeo name. The US market version of the Mondeo is called the Ford Fusion. Don't think Ford won't drop the Mondeo name. We already know the forthcoming Mondeo Vignale will not use the Mondeo name and branding. The car Richard spotted has one further trick up its sleeve. It is registered with DVLA as having a 1000cc engine. Therefore it uses the 123bhp, 1-litre, 3-cylinder EcoBoost engine. The 2014 Mondeo weighs around 1500kg so 123bhp should be just enough to tug it along. Would you be sad to see the Mondeo name dropped?